How many of my blog readers remember about my blog being enabled with Apture Highlights? It’s very sad that this beautiful feature is now no more. I got to know this long back, but the feature that I added on my blog still worked; until this morning. I am not sure what to express, but only one thing which I feel right now is this: Google, you have successfully killed one more beautiful product. 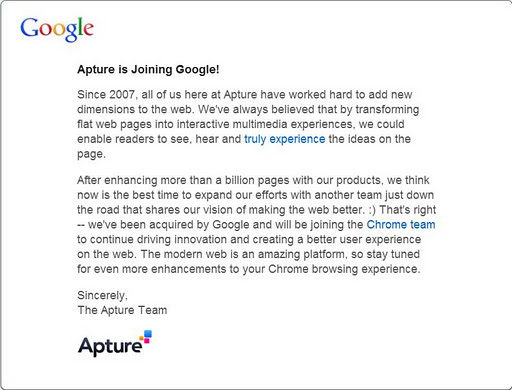 RIP Apture. I loved your features. I loved the way you simplified my vocabulary learning. I loved the way you just simply popped out of the web page without taking me to any other site. I loved the way you were just a simple yet catchy product called Apture. I was so in awe that I put your logo on my blog and proudly claimed that my blog got “Aptured”. I will surely miss you.